I’m on break from cute lunches this week – we are moving on Saturday and I’ve had to pack most of my bento stuff away. Due to Celiac Disease and food allergies the girls need to take lunches every day no matter what, but I’m not putting in effort to make them cute. Well, with one exception. I wanted to pack a couple St. Patrick’s Day lunches, and as that’s coming up on Monday I decided to pack a St. Pat’s lunch today. G2 has her lucky lunch packed in an Easy Lunchbox. In the large section is cheese cut into a 4 leaf clover shape with a cookie cutter. In one silicone heart cup she has Havarti with dill cheese and a 4 leaf clover food pick. In the second cup she has multigrain gluten-free crackers and a shamrock hat cupcake ring. At the top right in the small section are a couple Glutino chocolate wafers along with a couple of the Annie’s chocolate and vanilla bunnies. At the bottom right is 1/3 of a Sumo tangerine with a leaf and a daisy food pick. If you can find Sumo tangerines, get them! They’re the easiest peel thing in the world, and they’re sweeter than Clementines or even my beloved Satsumas. I found them in Whole Foods, but other stores might have them. Pricey but delicious! I didn’t have a St. Pat’s Lunchbox Love note, but at least it’s green! As an aside, I bought a Juice in the Box container for G3’s lunches, and it was packed in with her snack (half day today! Yay!). We’ll see how it fares with leaking or not, and I’ll report back next week. I’ll see you all next week for another St. Pat’s lunch on Monday, until then I’m going to pack. And then pack some more. And maybe then I’ll pack. It’s getting close to spring! Not that our part of New England has heard about it, but that’s what the calendar is saying. We’re getting tired of below-freezing temps and hoping for flowers to bloom and to see frogs when we go to the pond. Today’s lunches are reminders that spring is around the corner. G2 has a froggy lunch in her Easy Lunchbox. At the top left is a Lunchbox Love note that has a frog joke. Inside the bento are two silicone cups – on the left are some multigrain gluten-free crackers and on the right is Havarti with dill cheese and a frog food pick. 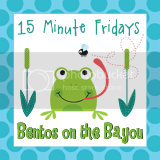 (As an aside, we were listening to the Muppets while we painted, and seeing a blue frog reminds me of the song I’m in love with a big blue frog…” which we love. I hope G2 remembers it, too!) Also in the large section of the bento is a frog cut out of cheese with the CuteZCute animal friends cutter and a few flowers cut out of cheese. At the top right are some green grapes with another frog. At the bottom right is one of the cupcakes G3 made for everyone and a flower food pick. G1 also has a froggy lunch. She has nice hot tomato soup in her Thermos, and cold goodies in her Totoro Bento Box. At left, in the top section, is one of the cupcakes G3 made in a silicone cup and another silicone cup and a Laptop Lunch Bento Buddies container with green grapes, a frog, a ladybug, and a leaf. At right, in the bottom section of the bento is a frog cut out of tofu with the CuteZCute cutter and some flowers cut out with a vegetable cutter. I also included a Lunchbox Love note to make her smile. Her school had 2 bomb threats on Tuesday, so she’s a little nervous about being in school today. It’s nice to have the Lunchbox Love notes to send a little love in her lunch! March 2 was Dr. Seuss‘s birthday, and because that was a Sunday I sent my girls to school with Dr. Seuss lunches on Friday and today. Here are two very similar lunches for two very different girls. G2 has a Cat in the Hat themed lunch. I know that the cat from the CuteZCute Animal Friends cutter isn’t exactly like the Cat in the Hat, but it’s a cat and I was tired. In her Easy Lunchbox G2 has MOMables-inspired gf crackers in one silicone cup, and Havarti with Dill cheese in another cup. Stuck inside the cheese are alphabet food picks spelling out Cat and Hat. Below the cheese and crackers are a CuteZCute cat and a Cat in the Hat hat, details drawn with food-safe markers. At the top right section she has 2 macaroons and a Glutino chocolate wafer. At the bottom right is a container of diced peaches in juice. I was so busy painting over the weekend that I forgot to buy fresh fruit, so she has canned fruit. Whoops! She also has a Lunchbox Love note to make her smile. G1 also has a bento with a Cat in the Hat theme. She has tomato soup in her Thermos, and other goodies in her Totoro Bento Box. In the top section at the top left she has a Laptop Lunch Bento Buddies container with sliced oranges (we call them orange smiles) and a silicone cup with chocolate macaroons and a chocolate wafer. In the bottom section is a CuteZCute cat and a Cat in the Hat hat I decorated using food-safe markers. G1 also has a Lunchbox Love note to give her a boost half-way through her day. 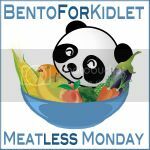 This post is linked to Bento Bloggers and Friends Dr. Seuss Linkup. March 2 is Dr. Seuss‘s birthday. Sadly, that’s a Sunday, so not a day for packing bentos. However, on the plus side, I can pack Dr. Seuss bentos today and on Monday, celebrating his birthday on two days rather than just on one! I have been very busy painting all the rooms in our new house, so I didn’t have a lot of time, and these were very simple lunches. G2 has a simple Dr. Seuss theme in her Easy Lunchbox. G2 was just saying “One fish Two fish Red fish Blue fish” over and over the other day, so I added two mozzarella fish and a Cat in the Hat hat to her slice of leftover gf pizza in the large section of her bento. Just in case my intention wasn’t clear, I used a heart cookie cutter with the mozzarella cheese and wrote Dr. Seuss’s name on it with food-safe markers. I also added some polka dot food picks to the grapes at the top right, because they reminded me of some of the funny plants in the Seussical worlds. She has some Glutino chocolate wafers in the section at the bottom right. I need to bake cookies this weekend – this past weekend was too busy with painting to do any baking. We’re running really low on baked goods! G3 has another One Fish Two Fish Red Fish Blue Fish themed lunch in her Totoro Bento Box, and tomato soup in her Thermos to keep her warm on this very cold day. In the top section of the bento she has Glutino chocolate wafers in a silicone cup. In a Laptop Lunch Bento Buddies container she has green grapes with the word FISH written out of alphabet food picks. In the bottom section she has One fish, Two fish (with the word TWO in alphabet picks), Red fish, Blue fish (with the word BLUE in alphabet picks) tofu. I also made a Cat in the Hat hat and a heart to hold the word blue. The coloring is done with food-safe markers and food coloring. My daughters don’t always request special lunches. Sometimes G2 will beg for a My Little Pony or Pokemon lunch, or yesterday G1 asked for tofu pandas, but usually they’re just happy to get whatever I make. Today, though, G2 and G3 both asked for Mickey Mouse lunches. And I can’t think of Mickey Mouse without thinking of the Mousketeers theme song, something I’m not sure my girls even know, other than the few lines I sing periodically. I was glad to find out that I had all the letters to spell out Mickey’s name across two lunches, though. G2 has a pretty simple Mickey Mouse lunch in her Easy Lunchbox. I got some Mickey Mouse food picks through eBay, and I’ve put Mickey hands into her grapes in the section at the top left. I used alphabet food picks to write out MICKEY, sticking them into Enjoy Life chocolate brownie cookies at the bottom left. In the main section of her ELB G2 has Havarti with dill cheese in one silicone cup, and heart-shaped MOMables-inspired gf crackers in another cup. At the bottom of the main section is a Mickey Mouse silhouette on Provolone cheese which I made using two sizes of circle cookie cutters and food-safe markers. I’ve also included a Lunchbox Love note in her lunch to make her smile. G3’s lunch is also a Mickey Mouse theme, and is also packed in an Easy Lunchbox. At the top right are two Enjoy Life Snickerdoodle cookies, one with a Mickey head sticking out of it, and one with the word MOUSE in alphabet food picks. At the bottom right are grapes with a Mickey hand and a Mickey head sticking out of them. In the main section of the ELB are two silicone cups, each with two Nut Thins cracker sandwiches with chocolate hazelnut spread. I used food-safe markers to draw a Mickey silhouette on the crackers, too. She also has a Lunchbox Love note joke that will make her smile, and make her friend who searches her lunches for jokes smile, too. I’m really glad that even though my kids are older than most bento-making parents’ kids, they still love getting a special lunch. The few times I’ve made a “normal” lunch since I started making bentos, they’ve complained. They tell me how much their friends look forward to seeing what I’ve done, which really makes me smile, and makes me want to keep making cute lunches.